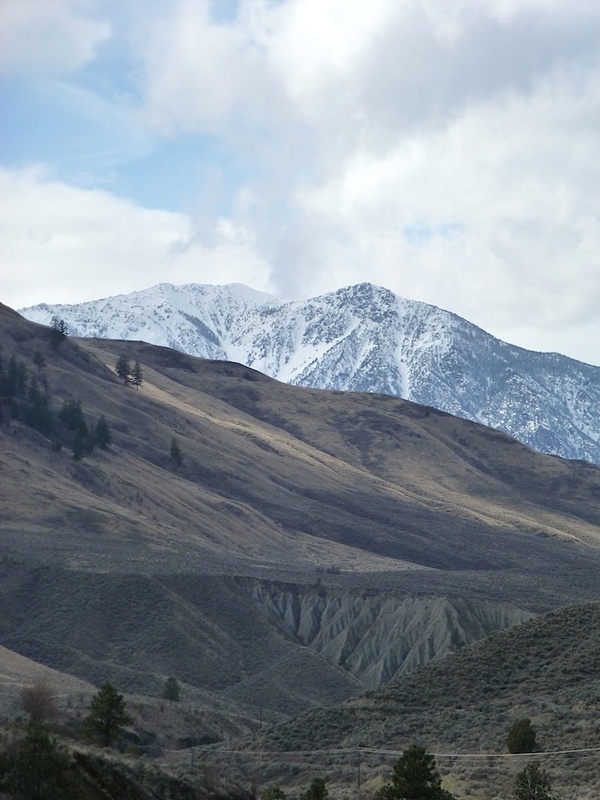 There is a mountain that turns the Similkameen River to the East as it crosses the Canada-US Border, and pushes it on to meet the Okanagan River at Ellisforde. It is called Chopaka. It is a sacred peak in the way that Mount Ararat in Turkey, where Noah’s Ark found dry land, or Delphi in Greece, where the Muses honoured by the priestesses of Apollo created poetry out of the thin mountain air. Here it is. Gold was discovered here in 1858. If I could, just for a moment, draw your attention to the erosion slopes in a bend of the river in that photograph right above you there. A modern technical society would describe those as silts from a post-glacial lake bottom, that were torn away suddenly when an ice dam broke and all the water cut down through them in an afternoon and an evening. To the societies that came before the Gold Rush and knew the land as a part of itself, these slopes were characters that guarded turning points in the story of the river, and guarded the people who lived above it, at Chopaka, Similkameen, Keremeos, Ashnola Mouth, 20 Mile Creek, Sterling Creek, Wolf Creek, and the Tulameen, where the flint and ochre for western North America — right into the plains — were mined. 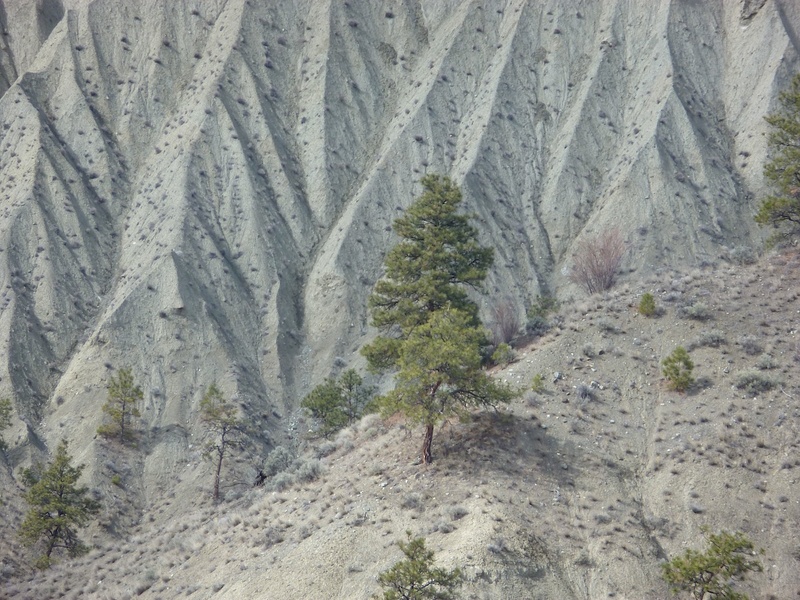 People moving upriver into Similkameen territory would have passed sites like this with care, if at all. 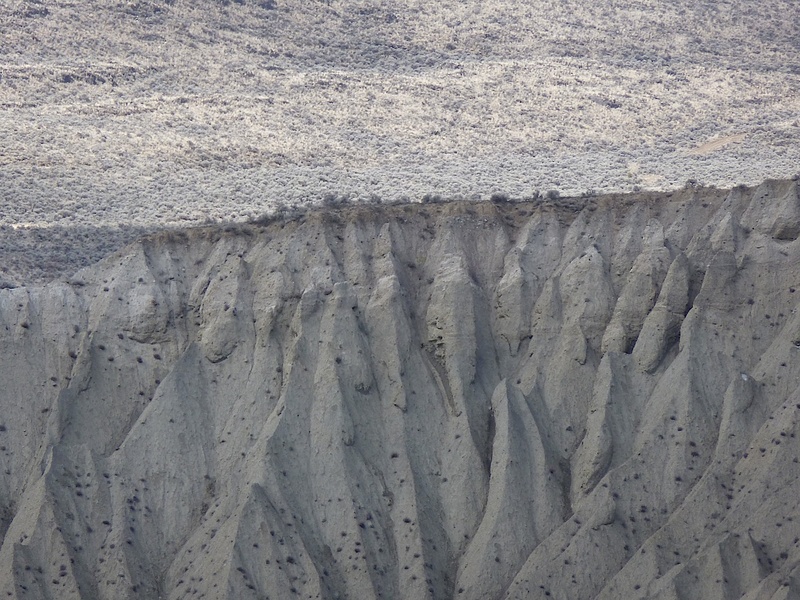 The Miners of 1858, would have been watched by these cliffs the whole time they were digging around in the ground. Think of this not as a series of photographs, but as a reading of the land, the way you are reading these words and the images scattered through them like stones in the current of the river.Here they are, even closer. Look how the trees are growing in the syntax of this story. The land is providing paragraphs and sentences. The trees and bushes are the words that fill them. Even people, passing by, follow the outlines of the story, and if this story is ultimately told in words, well, that’s because that’s what people do. They’re like that. The story is the earth. 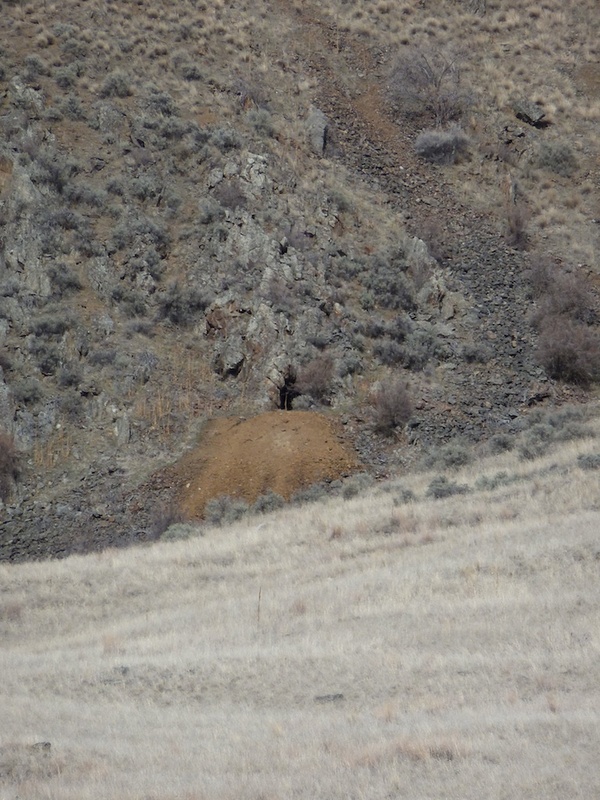 This is one of the literally hundreds of abandoned mine shafts broken into the mineral rich hills of the Lower Similkameen. 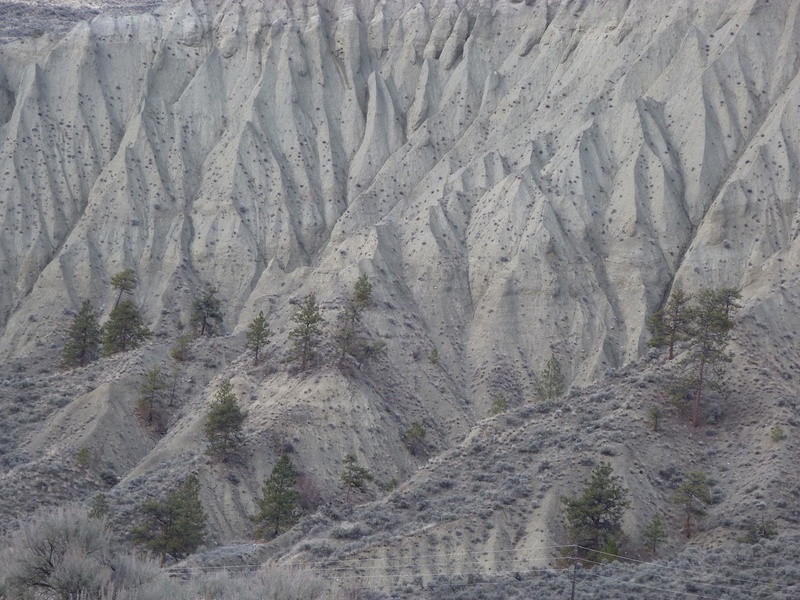 …or the land reclaiming mine tailings all on its own. And it takes, what? 150 Years? That’s nothing. … has grown out of the disturbances left by the men of 1858. I don’t know about you, but I was taught by the land, and then was schooled to tell stories in words and books, and now, now I’m listening again. 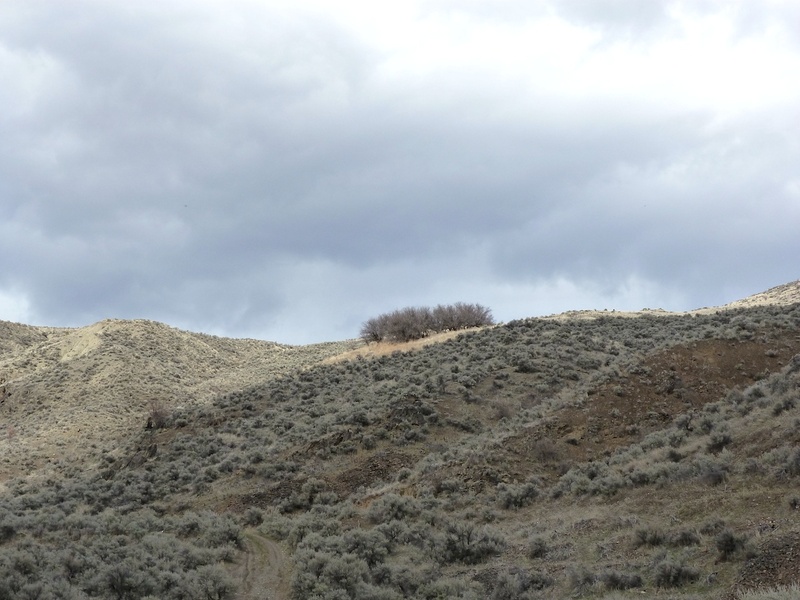 After 150 posts with Okanagan Okanogan, it’s clear to me that there is a way of writing that is also a way of agriculture and a way of technology in a broader sense, and they are all a way of the land in a country without borders. This way of story telling can be taught. I hope to lay down a few ideas in that direction later this week. Can’t wait for your ideas! 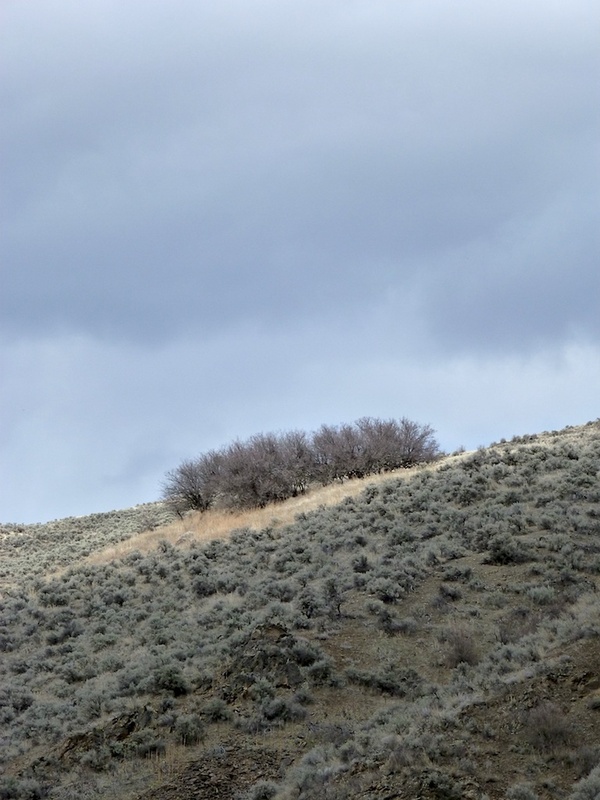 I like the close reading of bones and syntax of a landscape, a place, a body.